CleanStation is a fast, efficient support removal system with patented technology for faster geometry to model delivery times without suffering from warpage or delamination. The “set and forget” technology allows users the freedom of operating the machine without making constant adjustments. The systems offer quick warm-up and are programmable for time and temperature. Unlike ultrasonic systems, the CleanStation systems are NOT load sensitive, or geometry specific, offering efficient batch processing for maximum throughput. CleanStation support removal system are heavy-duty, industrial grade and “whisper quiet” operation makes it suitable for even office and classroom use. What Is CleanStation and How does it work? 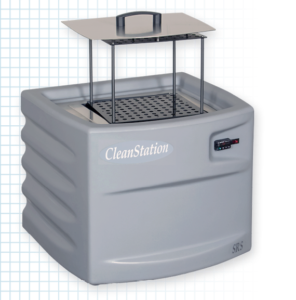 CleanStation support removal systems offer a non-evasive process that dissolves and cleans soluble support material from your 3D printed parts through a patented process of heat and agitation. 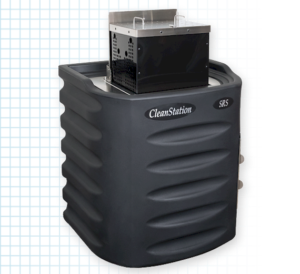 CleanStation controls both the temperature and the agitation of the cleaning solution that surrounds your 3D printed parts, maintaining the optimum level for your specific 3D printing technology. This controlled process is important in soluble support removal because each material that you use in 3D printing has specific environmental requirements. For example, you don’t clean PLA the same way you clean ABS or Nylon. The incorrect cleaning environment will damage your 3D printed parts, rendering them unusable. What 3D printing Technologies work with CleanStation? First off, let’s define what we mean by “Load Sensitive.” This means that if you place a large part, or a quantity of small parts, into the cleaning tank, the cleaning process will be affected, which can result in longer cleaning times and undissolved support material. All ultrasonic cleaners are load sensitive. If you put several parts, or just big parts with internal cavities, into its tank, they can obstruct the sound waves that actually do the cleaning. CleanStation in NOT load sensitive, offering users efficient batch processing. The speed and efficiency of the CleanStation support removal process is not affected by the size or quantity of parts placed in the machine, because it’s designed to dissolve support through heat and agitation that is not affected by obstructions. Is specific temperature important for cleaning 3D parts? Every 3D material has a specific operating temperature. This means that if you use the 3D material in an environment that has a higher temperature than that specified by the manufacturer, you can destroy your parts. They will lose mechanical stability at the inappropriate temperature. This is why CleanStation was created with a controlled environment that is temperature specific. CleanStation, unlike ultrasonic, has an internal cooling system that keeps your parts at the correct temperature. Ultrasonic machines will by themselves generate heat beyond the desired temperature. For example, if you were to take an ultrasonic cleaning system that did not have a heater in it and just turned it on, the temperature of the water would rise to boiling without any heater. This uncontrolled process is extremely volatile and can have serious effects on your 3D printed parts. 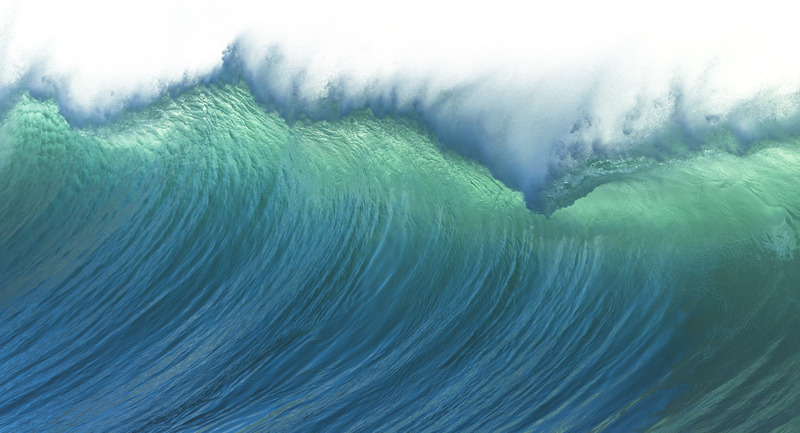 © 2002 - 2019 pM³ Technologies Inc.